HockeyBuzz.com - Ryan Wilson - Different lineup... different results? When you take a bad loss at the end of the regular season you don’t always have a chance to get revenge on that team. A lot of times you have to wait until next season. Pittsburgh will have a chance to rebound from their loss to Detroit on Tuesday night when they face them again at home this evening. Pittsburgh is two points ahead of Carolina and three points ahead of Columbus right now. The Penguins really need to take two points to avoid Washington in Round 1. Carolina finishes with New Jersey and Philadelphia. Columbus has a favorable finish with the Rangers and Senators. Needless to say two points would be great for Pittsburgh’s overall situation. The change I would make is not one that will be made. I would bump Blueger to center and put Johnson on the left wing. Malkin is going to make a huge difference on the power play. He is guilty of forcing the puck up high with his teammates flat-footed at times, but those mistakes don’t come close to outweighing his zone entries and ability to create time and space for his teammates in the zone. The Penguins power play has been 2-18 since Malkin’s absence from the lineup on March 16. The team’s overall power play percentage is 24.55% including the 2-18 slump. IF Kris Letang is in the lineup I think we will see a pairing that I’ve been yearning to see in action. It’s no secret that I think Olli Maatta is a chameleon who plays to the level of his partner. If that is the case it is a perfect opportunity to put him with the best and facilitate him playing up a level. There is a decent sample of Maatta playing well with Kris Letang. I don’t see the Johnson-Schultz or Pettersson-Gudbranson pairings being changed if Dumoulin is still out of the lineup (did not skate today day-to-day). It only leaves Maatta one place to play and I look forward to seeing it. 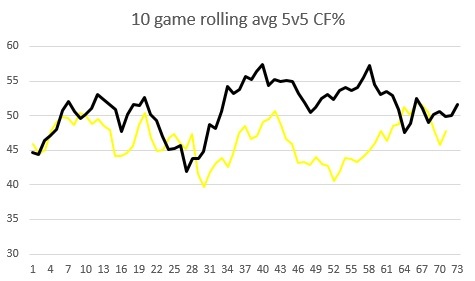 One line is Jack Johnson this season for the Penguins. The other line is Rob Scuderi’s last full year in Pittsburgh (2014-15). I bet you can figure out which one is which!